Taqueté Weaving Rule #25: Never re-weave unwoven thread. It's the end of the quarter and I spent this rainy morning filling glass Christmas balls with fiber. The fiber is the sewing thread that I took out due to some sort of error I discovered while weaving taqueté. Fixing mistakes is fairly simple with taqueté -put the heddles into their relaxed position, pull the threads out from each side, cut them off and start over with new thread. I never re-weave with those threads - that would be so time consuming! 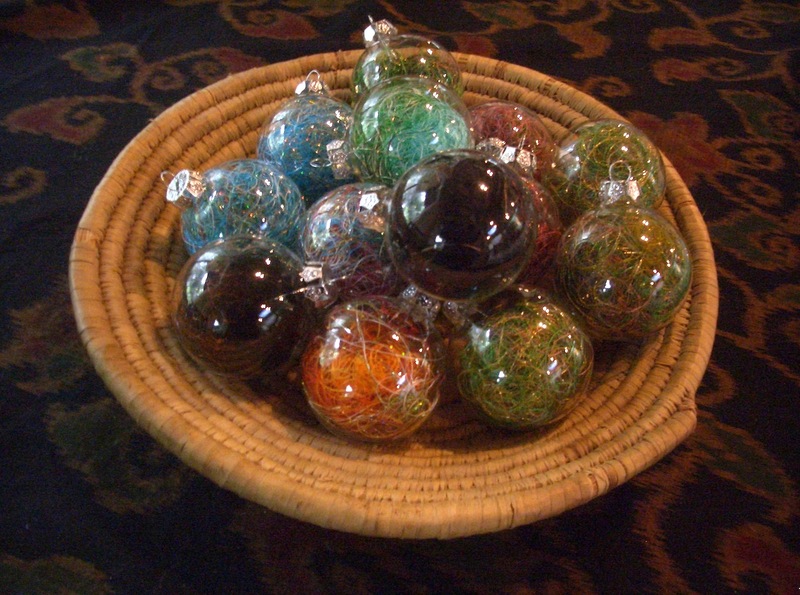 Plus, how else would I fill my empty Christmas balls? I have been planning a piece for the Glamour, Glitter & Glitz exhibit sponsored by Complex Weavers; the deadline is March 23rd. Fortunately, the entire submission can be done on-line and happy be happy, my weaving just came off the loom. 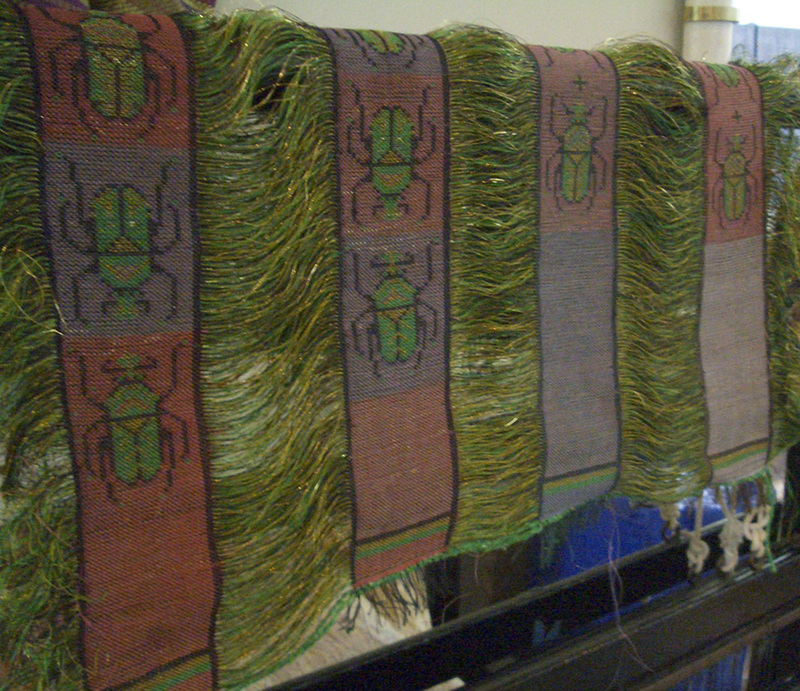 There was some question as to whether it would be finished or simply chopped off the loom. Static electricity made its first appearance in my studio and seemed to live continuously in my warp. I have never had this problem before in all my years of weaving. And naturally, I had a most complex weaving scenario going on, weaving three pieces at one time with four warps, seven shuttles and fourteen spools of rayon and metallic thread. It seemed all threads would simply hug the warp, any warp, every warp...grrrr.... lots of messes, errors and re-do's.... spritzing every couple of passes seemed to help in the short term. What would have really helped was a nice marine layer to roll in and fill our canyon with fog. I am glad I simply pushed through the static and got this done. I want to thank my DH for sticking in there with all the consternation and swearing coming out of the back studio. In the end, I think the three pieces will look absolutely exceptional once rested, trimmed, tweaked and mounted. And for my color study group - voilá - a tetrad!